My series of hurricane stories continues today with one of the worst on record, Hurricane Charley. 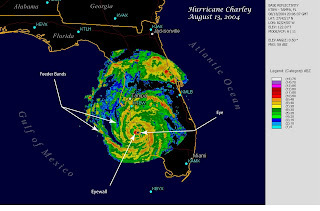 Charley made landfall in southwest Florida August 13, 2004. Charley lasted from August 9-15, 2004 peaking as a 150 mph Category 4 hurricane. He crossed Cuba as a Category 3 hurricane, causing heavy damage and 4 deaths. On August 13, the hurricane crossed over the Dry Tortugas, less than 24 hours after Hurricane Bonnie struck NW Florida. This was the first time in history that two hurricanes struck the same state in a 24 hour time period. At its peak intensity of 150 mph Hurricane Charley struck Captiva Island in southwest Florida causing severe damage. Charley continued to produce severe damage as it made landfall near Port Charlotte, Florida with winds of 145 mph and a central pressure of 941 mb. He passed through East Orlando with wind gusts of 105 mph. 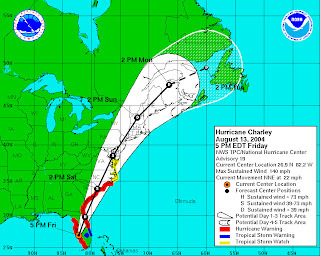 Throughout the United States, Charley directly caused 15 casualties. Charley caused $15 billion in damage making it the fourth costliest hurricane in United States history. On mainland Florida, Charley produced a storm surge peaking at 10-13 feet at Vanderbilt Beach near naples. Rainfall peaked at 9.88 inches in Bud Slough in sarasota County. Punta Gorda and Port Charlotte were leveled. Trailer parks were destroyed as far inland as Orlando.